Oz goes to Palm Beach: What are you doing for Earth Day? Many of the animals at the Palm Beach Zoo are on endangered or threatened lists. Unfortunately, the numbers of koalas in Australia have dwindled so much that I fear many of my relatives and friends may be in jeopardy. The good news is that there are places like the Palm Beach Zoo that work hard to protect endangered animals and the zoo is deeply involved in conservation efforts around the world. Hopefully when I get to the Palm Beach Zoo I'll meet a young sheila and we can start a family. 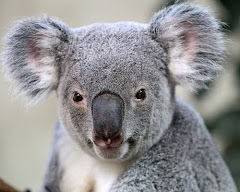 Every new joey raised at the zoo increases the chance of koalas surviving. You can help by donating to help me get to Palm Beach...and please support all the great work that they do to help the many endangered species at the Palm Beach Zoo.